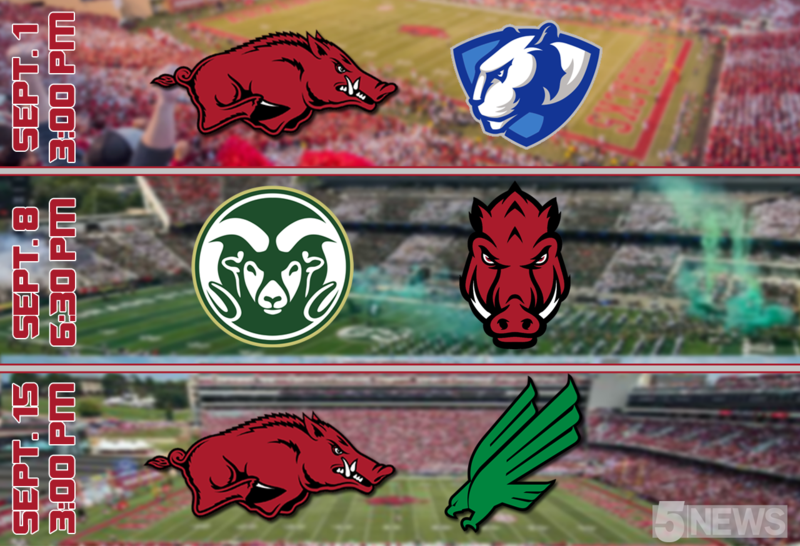 FAYETTEVILLE (KFSM) – As the SEC meetings wrap up on the final day of May, fans can now start planning their first three weekends of September as kickoff times for the Razorbacks games have been announced. Arkansas will begin the season against Eastern Illinois on Sept. 1 with kickoff schedule for 3:00 p.m. and the game will be broadcast on the SEC Network. Week two’s contest at Colorado State had already been announced for 6:30 p.m. on the CBS Sports Network and the Sept. 15 game vs North Texas will start at 3:00 p.m. on the SEC Network alternate channel. The 2018 season will be the first with head coach Chad Morris leading the Razorbacks. Arkansas went 4-8 in 2017 and led to the firing of Bret Bielema as the team’s coach. The remainder of Arkansas’s start times will be announced in the weeks leading up to that particular game.